How to draw a witch. 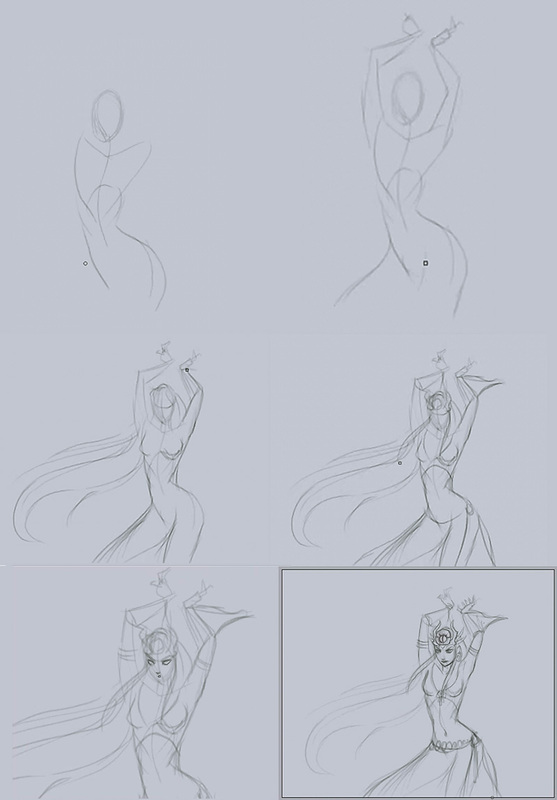 This tutorial is a step by step and video (coming soon) how to quickly design a witch character with dynamic pose. In this character sketch, I was trying to create her along the line of witch doctor type. A witch doctor originally referred to a type of healer who treated ailments believed to be caused by witchcraft. It is currently used to refer to healers in some third world regions, who use traditional healing rather than contemporary medicine. In the first world, it is sometimes used derogatorily to refer to chiropractors, homeopaths and faith healers. Her costume pretty much reflect the witch doctor type rather than a typical witch with a tall hat. It is a very quick and fun drawing I did a while back. Here is a drawing of a witch. It was done in 2007 so I might redo it and make it prettier some time soon. Watch a drawing video tutorial how to draw a witch. Below are step by step how to draw a witch. Step one, I sketch out spine line, the middle line, as loose “S” curve. Then I add a torso, hip and then head. Step 2, I draw both of her arm in up pose as if she is holding something on top of her head. Step 3, I fresh out the figure and draw both of her thighs along with her long hair floating to the left. Step 4, I put costume on her with some head dress decor. Step 5, I get up close and draw her face. Step 6, I draw a solid line through out the whole body then draw more detail on her outfit. Then how to color step by step. Then I add medium gray onto the figure and her dress. Next, I paint some texture in the background loosely. Then I paint some color on her skin tone. Watch the video tutorial for more instruction in detail.